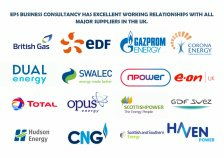 If you are a business consumer, switching energy supplier or setting up a new account as soon as you move into new premises can make a big impact on cutting your bills. Whatever your business, the following hints and tips will help you when you’re comparing deals and switching to a new supplier. Ask your own supplier if it has any better offers. This will give you something to use as a benchmark when looking at other deals. Note that if you are consuming energy on a default – or deemed – tariff, your supplier has an obligation to take all reasonable steps to tell you about other available contracts and how you can get information on these. Taking regular meter readings will help build up a picture of your consumption over time. You may need to know your consumption so that other suppliers can provide a quote for you. Your meter has unique registration numbers: the MPAN (meter point administration number for electricity meters) and MPRN (meter point reference number for gas meters). Give these to your new supplier. You can find them on your meter, as well as on your bill. Make sure you know the terms of your current contract. For example, how long before your existing contract ends can you tell your supplier that you want to switch? Many contracts will only allow you to do this at certain times. When you are talking to a competing supplier ask them to explain the terms and conditions of their deal so you can make sure you fully understand them before you sign up. Can suppliers object to switching? Your current supplier can object to you switching, but only under specific circumstances, which will be set out in your contract. your contract has expired and you are not bound by its terms. how you can resolve this if you think you have a case. In November 2011, we published an open letter reminding suppliers of their licence obligations. There are some examples of good practice set out in our Retail Market Review: Non-domestic Proposals consultation, in Appendix 2, page 49. Some businesses choose to use Third Party Intermediaries (TPIs) to help them compare their current deals with those of other suppliers. how their services are paid for (for example, will its commission be included in the prices you are quoted or will they charge a one-off fee?). If you have any concerns about the actions of a TPI you can talk to your local trading standards department which, along with the (OFT), has enforcement powers which may apply to some forms of misleading information and communications. COFFLED paid attention to supply high qualitly water bottles for a few years,and has been one professional supplier for over ten years. Made of Tritan Material and silica gel.All the materials are made for safe water.The capcity is 280ml. It should be an essential water bottle for your trip or work. Couldn t be easier to use and clean.Really simple but does a great job to keep water inside warm. Can be used to soft drink. It brings you courage and furious,like reborning. To show a Faction lady,be appreciate. Thanks for taking time to read it ,have a good day. You worth it ,Taking this bracelet, love and happiness will be in the front waiting for you.